I can’t help myself. This is the inaugural pot of tea in my new Bodum teapot. The glass strainer in my last teapot broke after about a year’s use, leaving me to make individual cups of tea. This is quite inconvenient, since I make tea for two on a nightly (and daily) basis. Cleaning two teacups, lids, and strainers twice a day is drudgery. 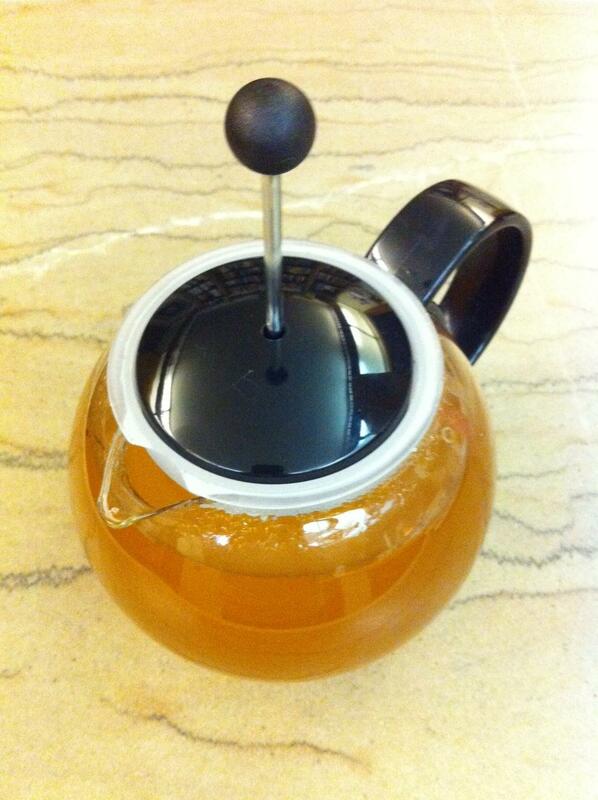 This particular pot of tea is Teavana zingiber Ginger coconut tea, our current caffeine free tea. Yum! Where did you find a Bodum tea pot? I have some Bodum glasses, is it the same brand? The very same, Mom. They make coffee presses, glasses, and tea pots/presses. This one is cool because once you press the plunger down the tea is separated from the water, making over-steeping impossible. I ordered it from Amazon.com. They had the best price and, of course, free shipping. Since teapots do not get quite the same handling as glasses, I’m hoping it will hold up a bit better. Hi I have several Bodum tea pots and I love them. One large one rarely used; a smaller one for when a friend calls in and two for single servings. I also have several china pots but they are so much harder to clean. Enjoy tea in your new pots.